Anxiously awaiting some info on how we can do this. It looks like we have to pipe 5 or 6 hoses together while planning for a sensor. It would be great to remove this housing, and the coolant reservoir tank and get lots of open space between the cylinders. Well good luck though some of us wonder why? If it is for "looks", cool but it sounds like a lot of work. As for cooling, I have run a thermostat for the last 17 yrs in a VTR in all temp conditions (from snowing out to over 100F in traffic) and never had a cooling issue. In fact in has never gone past the 1\2 way mark, well maybe a little past but the fan brings it right back down. Before this is taken wrong, the point I am trying to make is that if you are having a cooling issue, pulling these bits out isn't going to make things better. In fact it might get worse if you end up with the coolant moving too fast through the system. Good to hear from you hawk!!!! In my mind this mod was just to allow more open space in the frame, not to "fix" anything cooling related. You know how it is, winter, can't really ride, so we need something to do and call a "mod"
I'm with James on this. I want the clean look so the HRC overflow bottle is on it's way and starting to think about how to make up a pipe that will accept the temp sender as well as all hoses. Don't have a thermostat anyway so might as well ditch the housing and give the bike a different look. I was thinking of a similar idea, removable stainless steel washers for flow restriction. That way we could modify the ID of the washer to get the temp right. Basically a restrictor plate. I never thought of the flow rate of the coolant. I like the idea of the stainless washers. At the moment I am doing a resto job on my brothers TLS 1000 so this mod will not happen until next year. I am going to fit the HRC coolant bottle when it arrive though at the moment my hands are full with this! TLS' are awesome! Tell me it's forest green with Yosh cans and i'm sold! It's funny you posted that link. I was thinking about one of those yesterday. I bought one years ago for my trx250r so i could put a coolant temp guage on it. Worked perfectly! Wonder if we could modify that to fit? The TLS is red of course just like my bike, wheels are white with chrome lip as well, did all,of that 3,years ago. My brothers bike suffers from lack of maintenance and at the moment I am doing a big make over. Even the swing arm bearings were seized. Everything I touch is unserviceable. This is the focus of my attention at the moment so you will have to excuse me. Next year will be a different story though as I will be able to enter bike of the month again. Lots of stealth mods planned for the VTR. sj, those adapters look the goods will have to measure the hoses to get the right ones! The first part in the thermo housing removal. Still occupied with the bros bike so I am amassing parts for the next round with the Storm. Won't happen until the new year though! Ordered it from E Bay U.K. Took awhile to get here. They have the hoses and cable ties as well. Well the bros bike is finished . This is how it ended up! Now that that is over I have the VTR on the ramp and am about to start the coolant bottle removal. I have this weekend off and if the weather is good I will ride the VTR and then start the coolant bottle replacement. Pics of course, and sorry James but you did say this thread was reserved for me! Lol... The TL looks good. Something like that, coupled with a reducer from the big radiator hose, would probably work well... These were just my findings on the internet, i haven't been able to scour any auto shops yet. I will incorporate the carb heater lines in the system though, so that setup stays stock. My hope is that we can mate the big radiator hose to the front cylinder head spigot (keeping the hoses close to the head), then T down to the V of the engine, then 90 degree back up to the rear cylinder head spigot. Somewhere in there we can 1) T off for the carb heater hoses, and 2) have an adapter for the coolant sensors. My goal with this is mostly cosmetic, but also some functionality of cleaning of this area in the frame, so we can get our hands in there a bit better. Guys , I haven't had a close look at this yet, like you James I want an uncluttered look . As I have no thermostat this will probably be easier for me. Will have a better idea of what I need when I pull the coolant bottle. Without looking my thoughts are an alloy tube with a thread for the sensor and barbs for any coolant lines such as carb heater hoses etc. I was thinking the same thing about an alloy tube. Location of the sensor is a factor if you have a thermostat which I don't, however I will need to work out where to put the sensor so that I get an accurate reading. James, which way does the water flow? Clockwise or anti clockwise? Silly question I know, only want to do this once. I'm pretty sure with the electric pump it flows clockwise. I'll have to check it out tonight! With the electric pump the coolant flows clockwise on my bike. Have pulled the original coolant bottle. Had a look and think that I can get a tube fabricated that will take the hoses and sensor. I only need to accommodate 4 hoses , two sensors and that's about it. As I want to ride the bike the relocation of the thermo housing is not essential at this time, however I have taken a lot of photos and will slowly source the bits and pieces required. I want the housing out of sight so it may take a bit of fiddling and lots of time. Removed original coolant bottle, ugly big monstrosity it is! Picture of thermo housing with 3 radiator hoses and carby coolant line. 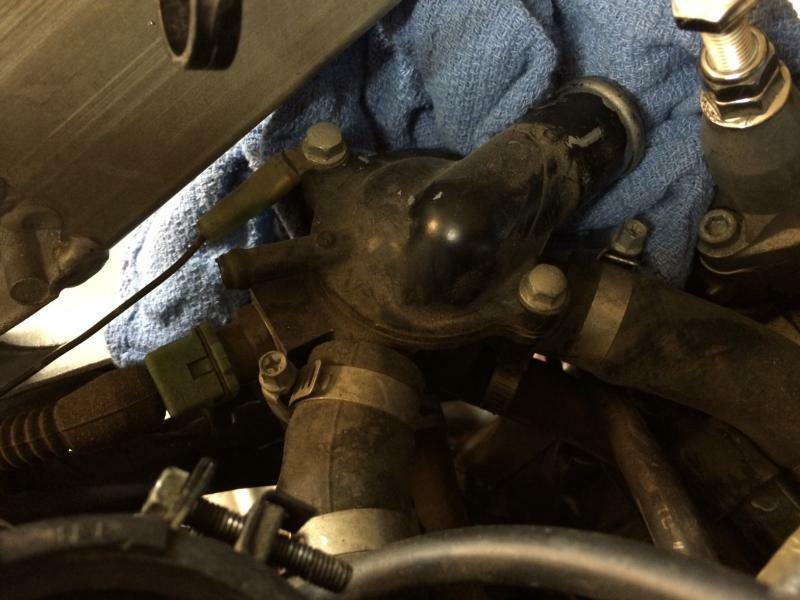 Coolant line to carbies is at the bottom of the housing. Just need to figure out where the new hose pipe can be mounted so that it is out of sight! The more I look at this the more I think that I will mount the new pipe low down in the V and then make a cover to go over it to keep it neat. I have mounted the HRC bottle in the tail as I don't like the look of it behind the front side fairing, sort of defeats the purpose of tidying things up. Will post pics when it's done. Coolant bottle in the tail and hooked up to the radiator, I ran the line inside the frame in an effort to keep things tidy. The seat fits and locks in place , just need to secure the bottle and run an overflow down to the front of the engine where all the other overflow hoses are. Last thing I want is coolant spewing over the **** end of my bike. The V definitely needs tidying up! Quick Reply: Thermostat Housing Removal!